We've got an Office 365 project that should help us manage a couple of hundred retail stores from a central office. 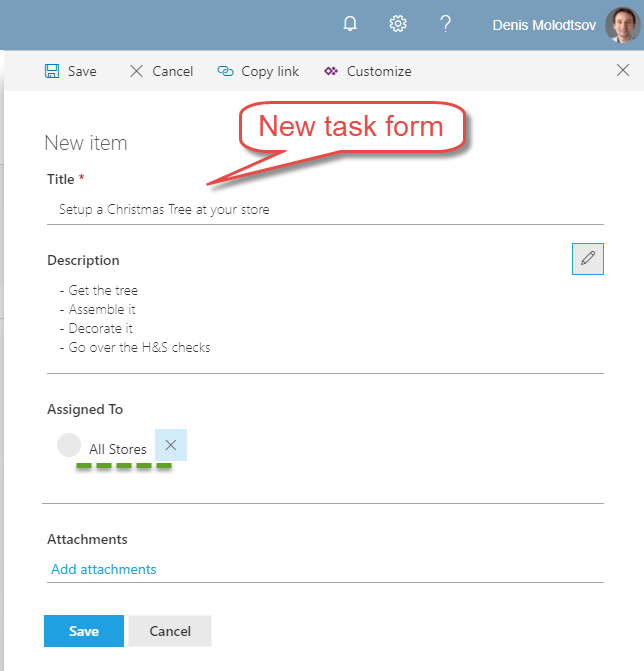 The idea is to send a task to a group of stores (one task per store) or to all of them. Every store should receive a separate task and their management should complete it. Would it be a good idea to assign a task to 100+ users by using a Designer/Nintex Online Workflows? I am concerned about the sheer number of tasks each workflow can generate. In theory, it should just work fine, but I am not sure if it's an enterprise-ready and a safe solution. Can someone share their experience and the ideas of the implementation? How did it work out in the end? Sorry for a slightly open-ended question. There was a similar question concerning SharePoint Server, but it still has 0 answers. Creating 100 tasks in Nintex or SharePoint Designer workflows might not be the best option. Instead, I highly recommend using Microsoft Flow with the OOB Approval action. In fact, I can assign 100 approval tasks within a single MS Flow. That works extremely well. There are even Approve/Decline buttons that are rendered right in Outlook email. Not the answer you're looking for? Browse other questions tagged sharepoint-online workflow office-365 tasks or ask your own question.